Sales teams can be highly motivated by non-cash rewards programs. 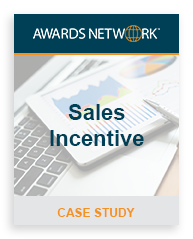 Awards Network’s online incentive program is a perfect fit for busy sales managers who want to implement a sales contest or sales incentive program quickly. Our wide variety of brand name merchandise, gift cards and travel experiences will appeal to any demographic and ensure your rewards catalog has items that your sales team will want. With Awards Network’s reporting dashboard, sales managers can track the sales incentive program progress online anytime and from anywhere. Client wanted to increase sales and referrals by rewarding employees and insurance agencies who referred businesses or home owners to the company. Awards Network designed an online incentive program featuring brand name merchandise, travel and gift card options. Employees and insurance agents could sign up for a free account to start earning rewards. Awards Network worked with the client to design a set of goals and budget along with ways to promote the program. Each approved referral earned the participant $15 worth of points. Depending on the value of the job once completed, the employee or agent could earn between $20 – $1000. A total of about 150 participants are currently active in the program. The client was satisfied with the results of the sales incentive program and renewed it for the following two years. They have also decided to start rewarding participants who sign up for continuing education courses and for completing them. Ready to find out how our sales incentive programs can work for your company? Contact Awards Network to discuss how our sales incentives can boost sales and engagement for your organization.